Orchard Cottage at Braidwood Castle in Braidwood, near Carluke, Glasgow and the Clyde Valley sleeps 2 people. Braidwood Castle near Carluke is set in the lovely Clyde Valley; this charming detached stone cottage lies within the enclosed, shared grounds of 500-year-old Braidwood Castle. The castle has been owned by the same family for 350 years, and was built around 1581 as a fortified tower to protect the Douglas family and neighbours from Border Reivers. The south-facing cottage was built as a bothy for the tower, and has been transformed into very comfortable accommodation for two people. The spacious living room has a cosy wood burner and there is a wet room, compact kitchen and a comfortable bedroom. Outside, there is a lawned area around the cottage with garden seating. The orchard and grounds are shared with guests at the castle. There is a soothing sound from the Braidwood Burn (fenced) just below the cottage, and there are walks down to the River Clyde through a network of paths nearby. The central location enables easy access to some wonderful countryside in the Clyde Valley Woodlands National Nature Reserve just north of Lanark, 5 miles, where there are way marked trails to explore. At the UNESCO New Lanark World Heritage Centre on the magnificent Falls of Clyde, you can discover how life was lived at the beginning of the Industrial Revolution. Enjoy a day in Glasgow which is very easy by train from Carluke. The shop is 1 mile from Braidwood Castle near Carluke, with the pub and restaurant ¾ mile from Braidwood Castle. 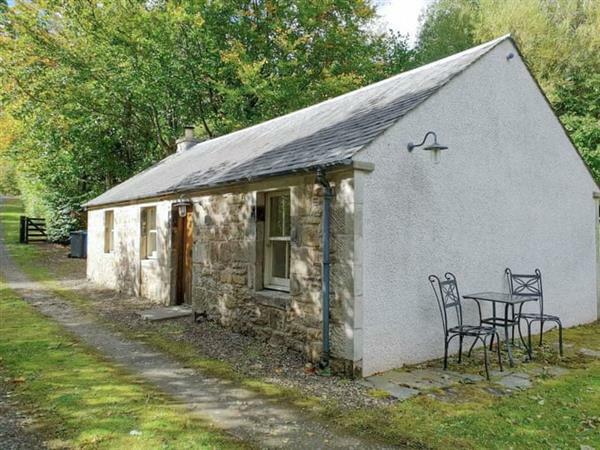 Orchard Cottage at Braidwood Castle can be booked together with Braidwood Castle to sleep up to 7 people. Step to entrance. Orchard Cottage is all on the ground floor. Kitchen: Galley style with electric oven, electric hob, microwave, fridge and washing machine. Electric central heating, electricity, bed linen, towels, Wi-Fi and logs for wood burner included. Welcome pack. Shed with tumble dryer. Large enclosed garden with sitting-out area. 1½-acre natural grounds with lawned areas and orchard (shared with Braidwood Castle ref UK10672 [Braidwood Castle]). Bike store. Private parking for 2 cars. No smoking. Please note: There is a fenced stream in the garden, 20 yards away. Holidays at Orchard Cottage at Braidwood Castle, Braidwood Castle run from Friday to Friday. Pets allowed at Braidwood Castle - Orchard Cottage at Braidwood Castle. For a better idea of where Braidwood Castle - Orchard Cottage is, you can see Braidwood Castle - Orchard Cottage on the map below. Braidwood Castle - Orchard Cottage is in Lanarkshire; should you be on the lookout for a special offer, you can find all the special offers in Lanarkshire. It's always worth checking to see what is on offer at the moment. Do you want to holiday near Braidwood Castle - Orchard Cottage (UK10671), you can see other cottages within 25 miles of Braidwood Castle - Orchard Cottage; have a look to find your perfect holiday location.